Not everyone likes whitethorn, which can form impenetrable, thorny thickets and take over your land. But when it’s in bloom, the honeybees and other pollinating insects love it. 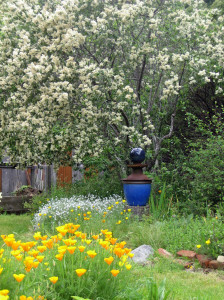 Whitethorn is really a ceanothus. Its scientific name is (Ceanothus incanus). 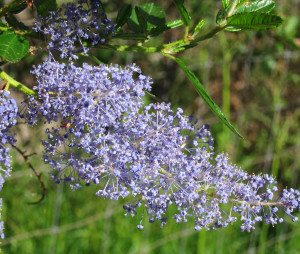 It blooms at about the same time as its relatives, blue blossom or California lilac (Ceanothus thyrseflorus) and tobacco brush (Ceanothus velutinus). If you happen upon the three species blooming together (for example, on land that was clearcut 10 or so years ago) the racket from the buzzing insects is amazingly loud.There are over 60 species and sub-species of ceanothus growing in California, some of them rare or endangered. Whitethorn, blue blossom and tobacco brush are three abundant species found here in SoHum. 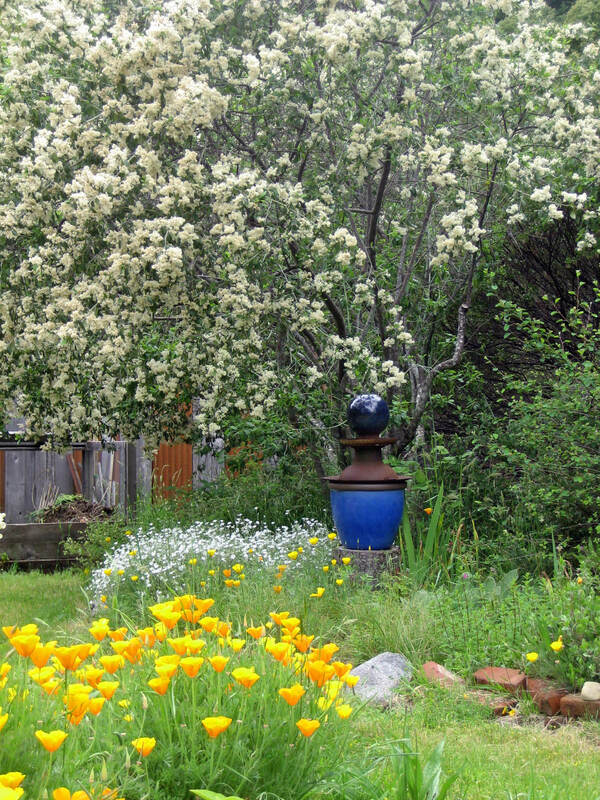 All three shrubs can grow up to 20 feet tall and look like small, multi-trunked trees. The flowers are small, about an eighth of an inch, but grow in clusters which makes them showy. Ceanothus leaves are distinctive in their veining pattern, running laterally through the leaf rather that radiating out from a central vein like a feather. When the weather dries up in late spring, ceanothus leaves shrink in size and become leathery, which helps them survive the dry summer season. Whitethorn flowers are a creamy off-white and the leaves are grey-green with whitish undersides. Blue blossom flowers are , you guessed it, blue. They range from vivid, dark blue to palest blue, and sometimes white. Their green leaves are from ¼ to 2 inches long, depending on how much sun exposure and moisture the plants get. Tobacco brush has white flowers and shiny, somewhat sticky dark green, fragrant leaves. 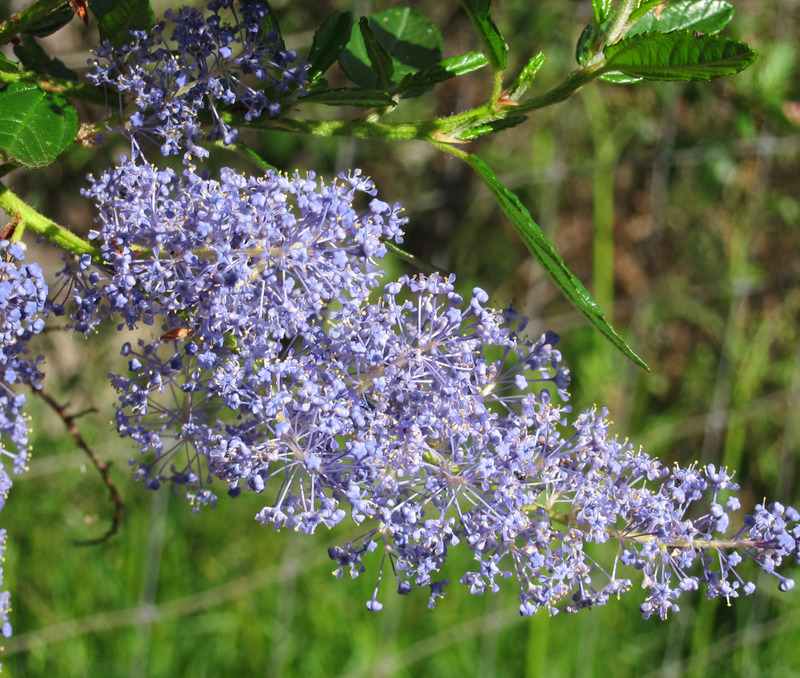 If you put any ceanothus flowers in water and rub them gently, a light suds forms which can be used for soap, shampoo or body wash.
Ceanothus species have nodes on their roots which fix nitrogen into the soil. This makes them pioneer plants especially adapted to growing in soils that have been disturbed, such as roadbanks or clearcuts. As pioneers, they not only nitrify the soil, making it more hospitable to other plants, but also provide a sheltering ‘nursery’ for tree seeds to take hold. Once these seeds grow up into oak or fir trees, they shade out the ceanothus species and the conversion from shrubland to forest begins. Because it attracts so many beneficial insects, whitethorn is a good shrub for the garden and looks fantastic with masses of California poppies growing at its base. It takes well to pruning, which not only keeps it in bounds, but keeps it looking healthy and vigorous. But watch out – those thorns can be painful!